Move to Paradise Where Utopia Awaits - At the center of everything Miami, this is the luxury mid-rise, lifestyle you desire: one, two and three bedroom apartment homes with direct walking access to amazing dining, shopping and cultural opportunities. Top it off with an incredible array of amenities like a private clubhouse, 24-hour fitness center, resort-style heated pool, I-mac Business Center, Gastro Pub, Garage Parking and you have all the ingredients for the luxe life. We offer designer kitchens with European striated cabinets, granite counter tops, farmhouse kitchen sinks, stainless steel appliance package and more. Our master suites are designed for luxurious living with double sink vanities, dual closets and separate shower and tubs. Other thoughtful interior features porcelain tile throughout the apartment, floor to ceiling glass doors, tall ceilings and located just minutes from the FIU campus and close proximity to all of the major thoroughfares. 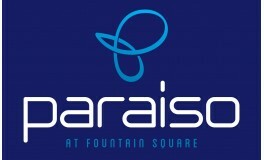 Choose Paraiso at Fountain Square for Miami apartment living, where only the best will do! Pets are permitted, call today for details. Weight and breed restrictions apply.